Susan Carew is Peacefull the Clown. She has studied Certificate II in Early Childhood Education. The programs are designed around the Early Years Learning Framework. Children will meet Peacefull the World Peace Clown. Peacefull will show them how she makes a culture of peace with all the fun things in her bag. She will bring her juggling balls and the kids will have a chance to learn to roll and catch the balls. She will tell her story of travelling the world as a peace clown to 20 countries meeting different nationalities. She will use puppets to demonstrate fighting and then how to make peace when someone takes your toy. Peacefull will bring out massages and blow bubbles. Children will learn the joy of giving and receiving. Session 1: Responsibility – In this session will talk about responsibility. Peacefull will do role plays with puppets around responsibility, a juggling story, breathing and walking meditation and colour in drawing on responsibility. Session 2: Empathy – In this session will explore feeling empathy for someone else ‘how they feel’. Peacefull will demonstrate moods, feeling emotions and expression, giving and receiving, asking about others, saying nice words, role play with puppets and meditation. Session 3: Awareness – In this session will show children pictures that have pictures in them – what is this? they will do a awareness game then notice, meditation/breathing, copying what is said, meditation to imagine. Session 4: Love – In this session Peacefull will show the kids Russia and her trip there. She will show some film. She will share loving jokes. Peacefull will play an activity about love, puppets talking about love. Why we use our arms to hug not hit. Session 5: Honesty – In this session kids will learn about telling the truth. What is true what is not? Peacefull will ask about lies. They pick a happy card for the week. A puppet role play on being honest. Peacefull will read a story. Imagining telling the truth when scared. Session 6: Oneness - In this session kids will learn about the world, it is one. That we are one family. They will listen to a story about same same but different. They will explore what is the same and different with their friends. They will have some toys to put together as the same and different. Peacefull will speak about clowns being different but the same. Session 7: Peace – This session is about peace. Peacefull will speak about being a peace clown, show the kids what makes her Peacefull. She asks them what makes them happy (peacefull), she will play games about peace, breathing in and out, bubbles nice thoughts, a story about peace, a happy card for the week, words that feel good and plastercine mold game. Session 8: Enjoyment - this session is about happiness, Peacefull will play music, play games and clown around showing what it is to be happy. They will have a joke, put on wigs and blow bubbles. The kids will say what makes them happy and how we make others feel happy. Peacefull will tell age appropriate jokes in each session. Children will learn values through activities, stories, the clown demonstrating the value (role play), puppets. Each session will build on the last and the Kindergarten can make the value the theme of that week. It is a good practice. Susan Carew aka peacefull will work with the Kindergarten. The World Peace Day (WPD) in dedicated to the International Day of Peace 21 September 2012 but can be run at any time during the year. The WPD is designed to deliver a session on peace, clowning and juggling. Kindergartens are encouraged to have the children focus on peace activities such as poetry, posters and art works to creatively display their ideas on peace. Peacefull the World Peace Clown will visit classes. the Kindergarten can use this day as a theme for focusing on peace. Children will develop a greater understanding of peace through the example of the peace clown and workshops designed to evoke a deeper understanding and experience of peace. Some of the values program will be used in this session. Peacefull can come to your Kindergarten for a special event – birthday, special event, occasion, celebration to add life to the session. 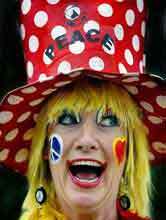 As a Peace Clown she can come and tell a story about the special theme and share fun games with the children. The children can colour in a peacefull picture and then clown around with Peacefull. The Kindergarten can take photos for the parents and give this as a gift to the families. The clown visit can be used to link to the Early Years Learning Framework. Their children’s happiness is important.